We are pleased to inform you that the Department of Internal Medicine IV of the Eberhard-Karls University of Tübingen, together with the Institute for Diabetes Research and Metabolic Diseases of the Helmholtz Center Munich at the University of Tübingen, Germany, organizes the 2nd Joint International Scientific Meeting "Diabetes Mellitus: Meet the Expert" on May 16-19 2019 at the Electra Palace Hotel in Thessaloniki, Greece. To watch photos and videos of the Joint International Scientific Meeting, please click here. Consultant in Internal Medicine, Department of Internal Medicine IV and Institute for Diabetes Research and Metabolic Diseases at the University of Tübingen, Germany. Preliminary Program of the 2nd Joint International Scientific Meeting: "Diabetes Mellitus. Meet the Expert"
Hans-Peter Hammes is section head of Endocrinology at the 5th Medical Department of the University Medical Center Mannheim, Heidelberg University, Germany. In his research, he focusses on the role of hyperglycemia and reactive metabolites in the pathogenesis of endothelial dysfunction and damage to the retinal neurovascular unit. He received his MD from the Westfalian Wilhelms University in Münster in 1980, and his board certifications in internal medicine in 1991 and in endocrinology&diabetology in 1996. In 2000, he was appointed Professor at Heidelberg University. He is spokesperson of two DFG sponsored internal research training groups and PI in the CRC 1118 „Reactive metabolites“, both located at Heidelberg University. He was awarded several prices including the Camillo Golgi Award of the European Association for the study of diabetes. Martin Heni is a researcher and physician at the University Hospital Tübingen, Germany. He is head of the Clinical Research Center for Diabetes. Furthermore, he is deputy head of the Division for Prevention and Treatment of Diabetes at the IDM of the Helmholtz Center Munich. His research focuses on brain control of human metabolism, the regulation of insulin sensitivity and secretion as well as the pathogenesis and treatment of type 2 diabetes and its’ complications. Martin Heni received his MD from the Eberhard-Karls-University Tübingen in 2008. Since 2015 he is board certified for Internal Medicine, Endocrinology and Diabetology. In 2018 he was appointed as Professor at the University of Tübingen. He was awarded with several prices for his research, including the Rising Star Award of the European Foundation for the Study of Diabetes (EASD). Cora Weigert is Professor of Molecular Diabetology at the Medical Clinic in Tübingen and at the Institute for Diabetes Research and Metabolic Diseases of the Helmholtz Center Munich at the University of Tübingen, Germany. Her research focusses on mechanisms regulating the metabolic adaptation to physical exercise as they are key factors in the prevention of type 2 diabetes. Combining molecular biological and “Omics” technologies (transcriptomics, proteomics, metabolomics, lipidomics) exercise-regulated myokines, hepatokines as well as metabolites are studied in primary human muscle cells, mouse exercise models and human exercise intervention studies. 1963 Study of Chemistry ETH Zurich Switzerland and Maximilian Ludwig University Munich Germany MLU Munich Germany.1968 Molecular Genetic Maximilian Ludwig University Munich Germany. 1972 PhD. Max Planck Institute of Biochemistry Proceptor Prof A. Butenandt (Nobel laurate). 1984 Head of Biochemical Departament of Research Group Diabetes of the University Munich. 1992 Director Experimental Development Drug Research Nycomed Oslo/Norwey . 2004 Head of Laboratory for Molecular Genetic and Diagnosis at Deparment of Internal Medicine University Tübingen. Research Interest: Diabetes: Molecular Mechanism and Genetic of type 2 Diabetes. Current position: Head of the Central Laboratory at the University Hospital in Tübingen and the "DZD clinical chemistry laboratory" at the Institute for Diabetes Research and Metabolism (IDM), Tübingen. Academic Education and Positions:1996-2003	Medical School in Würzburg, Sydney, Kathmandu and Zürich / 1999-2000 Research fellowship with Joel F. Habener, Laboratory of Molecular Endocrinology, Massachusetts General Hospital, HHMI, Harvard Medical School, Boston, USA / 2011 Consultant, Laboratory Medicine and Clinical Chemistry, Head of the Central Laboratory at the University Hospital of Tübingen / 2014	MHBA (Master of Health Business Administration) at the University Erlangen-Nürnberg / 2016	Appointed full Professor (W3) at the Medical Faculty of the University of Tübingen. Konstantinos Kantartzis received his MSc and MD in endocrinology and metabolism from the University of Athens, Greece, and his Habilitation at the University of Tübingen, Germany. He is consultant in Internal Medicine and member of the Clinical Research Team in the Department of Endocrinology, Diabetology, Nephrology, Vascular Medicine and Clinical Chemistry and in the Paul-Langerhans-Institute for Diabetes Research and Metabolic Diseases, Member of the German Centre for Diabetes Research, at the University of Tübingen, Germany. His research interests include prevention of type 2 diabetes and the impact of adiposity and body fat distribution, in particular fat accumulation in the liver (fatty liver, NAFLD), on the production and action of adipokines and hepatokines, and eventually on insulin sensitivity. Professor Norbert Stefan, MD, PhD, is holder of the Chair and the W3 Heisenberg Professorship for Clinical and Experimental Diabetology, Department of Internal Medicine IV, University Hospital of Tübingen, Germany. He is also Head of the Department of Pathophysiology of Prediabetes at the Institute of Diabetes Research and Metabolic Diseases (IDM) of the Helmholtz Zentrum München at the University of Tübingen, Germany. Professor Stefan's scientific interest is to understand the pathogenesis of prediabetes and type 2 diabetes and hereby focuses predominantly on the role of NAFLD, hepatokines and body fat distribution in this process. Hubert Preissl studied Physics and did his PhD at the Max-Planck Institute for biological Cybernetics in Tübingen. Afterwards he led the magnetoencephalography Center at the University of Tübingen and performed clinical and basic science brain imaging studies. Since 2000 he focused on the effect of metabolic signals in particular insulin on brain function. In addition he implemented the first dedicated fetal magnetoencephalographic system in Europe and investigated the development of human brain and autonomic nervous function in human fetuses and its possible alterations by the metabolic status of the mother. He currently holds a Professorship at the University of Tübingen on central nervous function and type 2 diabetes and heads the Metabolic Neuroimaging group at the Institute for diabetes research and metabolic diseases at the University of Tübingen of the Helmholtz Center Munich. Prof. Baptist Gallwitz is deputy head of the department for Endocrinology, Diabetes and Metabolism at the University of Tübingen, Germany and Past President of the German Diabetes Association. Baptist Gallwitz is board certified in Internal Medicine with a further specialisation in Gastroenterology and Endocrinology. His scientific focus is on the physiology of incretin hormones. He has been awarded a respectable number of awards and prizes including the Werner Creutzfeldt Prize awarded by the DDG for scientific work in the field of incretin hormones. He is also co-editor of the German standard textbook for clinical diabetology. The registration cost of 80 euro/person was valid until 16/3/19. After this date the cost is 100 euro/person. 3. Dinner on Saturday 18th of May. The deposit receipt should be sent via e-mail to reservations@medevents.gr or via fax +30 2310 801 454. On the transaction details please print the name of the Conference (DM) and the participant name. All proposals will be peer-reviewed by a Scientific Review Committee. 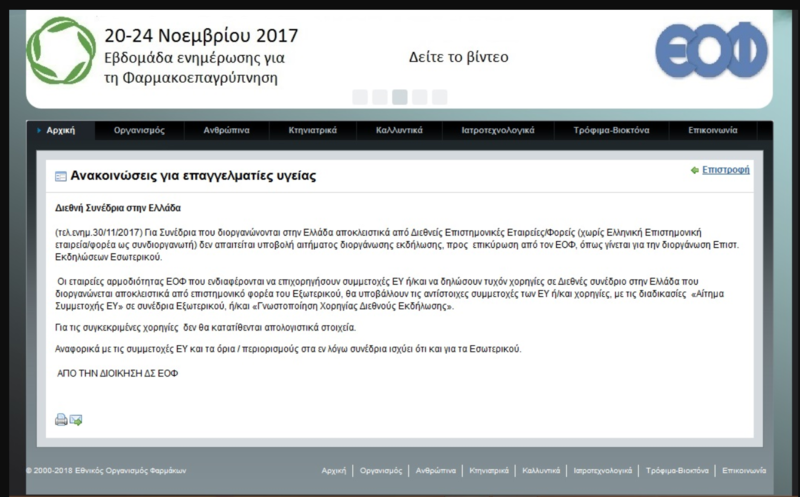 Accepted papers will be published in ”Hellenic Diabetological Chronicles”, the official journal of Hellenic Associaton for the Study & Education of Diabetes Mellitus. Abstracts of 200-300 words should be submitted by APRIL 1, 2019 for initial evaluation. Abstract should include the following elements:, Abstract Title (in capital letters), Authors and Presenter (capitalize each word), Working Origin (capitalize each word), The Department, Organization, City, Country should be indicated. As soon as the online submission is completed you will receive an automated confirmation email. After submission and before evaluation, changes and corrections are accepted. After review no changes are permitted. Confirmation of the acceptance or rejection of the abstract will be sent via email. Below exclusive rates are valid only for scientific meeting’s participants. If you would like to make use of these offers, please let us know until April 12th, 2019, the latest. All above hotel rates do not include “overnight stay tax” which is valid per night, per room and must be paid directly to the hotel upon check in. Please click here to pay with credit card via LivePay of Eurobank. The deposit receipt should be sent via e-mail to info@medevents.gr or via fax +30 2310 801 454. Technopolis, Building Thermi ΙΙ, 9th klm. Thessaloniki-Thermi, B.O. Box 60714, ZIP 57001, Thermi, Thessaloniki, Greece.